This Fusion redefines the family-friendly sedan segment with its breathtaking looks. It doesn't stop there. It also comes with very athletic ride and superb fuel economy. 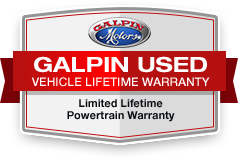 This Fusion has been through Galpin's meticulously used Car inspection and it could almost pass for a brand New vehicle. Call us to take this fashion-forward sedan home and let us show you what 'Galpin Used Car Difference' looks like.